Beachfront apartment with wonderful sea views and terrace. This one bedroom apartment is situated at the front row at Plage du Midi and offer a beautiful view of the beaches, the Mediterranean and the Esterel mountains. In the bedroom you have two single beds and if you need additional bed space you have a drop down double cabinet bed in the living room. 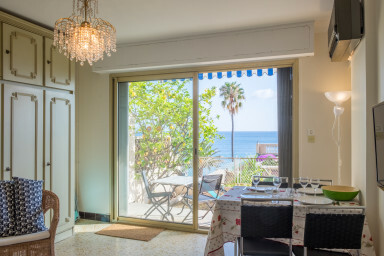 You have a terrace to the south overlooking the beach, with your own lemon tree. The building has one entrance from Rue George Clemenceau and one from Boulevard du Midi Jean Hibert, the street along the beach. The apartment is located on the Plages du Midi, just a few minutes walk from the Old Town of Cannes and the Palais des Festivals, Croisette and all else that Cannes has to offer. – Beach: Just outside the door. The apartment is lovely. It has a great location, 7 minutes to Palais de Festivals by foot. Nice, cozy living room, the kitchen, and bedroom are not large. It has the greatest terrace. The host organized everything perfectly. We will definitely stay at this apartment next time.